Dr. Sharp’s graduate work focused on using cell biology and genetic methods to understand basic cellular processes in bacteria. He worked on the DNA translocase SpoIIIE in Bacillus subitilus, where he used high resolution deconvolution fluorescence microscopy, fluorescent protein tagging, and immunofluorescence microscopy to study SpoIIIE during sporulation. After graduate school, he obtained a law degree from the Berkeley School of Law where Ihe focused on patent law. After law school, he worked as a law clerk for Judge Rudi M. Brewster, where he dealt primarily with patent cases. Following his clerkship, he became an associate with Morrison & Foerster, LLP, one of the largest intellectual property law firms in the Unites States. His legal practice focused on patent litigation, particularly in the life sciences and pharmaceutical industries. He has been the Director of Scientific Discovery at Linnaeus Bioscience Inc., for over 5 years where he combines and applies his scientific and legal training and experience. 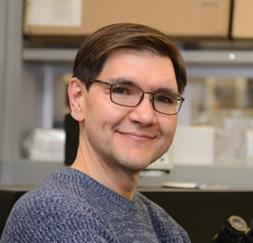 He has expanded the throughput of cytological profiling for antibiotic discovery and is in charge of developing our technology for therapeutic areas, including the discovery of novel antifungals.